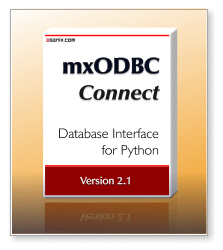 Unlike our mxODBC Python ODBC Interface, mxODBC Connect is designed as client-server application, so you no longer need to find production quality ODBC drivers for all the client platforms you target with your Python application. ODBC, or Open Database Connectivity, is the industry standard API for connecting applications to databases. In order to facilitate setting up ODBC connectivity, operating systems typically provide ODBC managers which help set up the ODBC drivers and manage the binding of the applications against these drivers. On Windows and Mac OS X the ODBC manager is built into the system. On Unix platforms, there are three ODBC managers, unixODBC, iODBC and DataDirect, which provide the same functionality on most Unix systems. mxODBC 3.3 Client API: mxODBC Connect Client provides the same interface as our stand-alone mxODBC 3.3 interface on all supported client platforms, including full support for stored procedures, customizable row objects, iterator support, catalog methods, context manager support, multiple result sets, result set scrolling, flexible parameter styles, etc. Easy Configuration: mxODBC Connect Client can be configured using an INI file or parameters passed in as Python dictionary. Highly Portable Codebase: mxODBC Connect Client is available for almost all platforms, Python can be compiled on. Superior Performance: mxODBC Connect provides better performance compared to a stand-alone mxODBC + ODBC driver installation. We have measured more than 10 times better performance using SSL-encrypted mxODBC Connect with MS SQL Server running on Windows, compared to a non-encrypted mxODBC + ODBC driver setup on Linux connecting to the same database. Enterprise Level Security: mxODBC Connect can use TLS/SSL encrypted connections and certificate based authentication - a feature that many native database client interfaces don't provide. Stored Procedure / Function Calls: directly call stored procedures and functions, using output and input/output parameters, as well as result sets for passing back data to Python. This gives you full access to your database systems from Python, without any need to adapt database APIs. Support for Input, Ouput and In/Out Parameters: you can freely use these parameter types in stored procedure calls, functions calls and regular SQL statement execution, allowing you to tap into all the flexibility your databases have to offer. Support for Multiple Result Sets: call stored procedures and access all returned result sets using an easy to API. Easily free up resources in case result sets are no longer needed. Support for custom Row objects: in addition to using standard Python tuples, mxODBC Connect can automatically return result set rows as custom objects. It comes with a set of optimized row factories for: TupleRows, ListRows and NamespaceRows. All of these provide both index and attribute access to row column fields - much like namedtuples in Python, only more efficient and specifically designed for result sets. ODBC and Oracle style parameters: mxODBC Connect can be used with both the standard question mark ODBC style parameter syntax (e.g. "... where id=?") as well as with the Oracle style named parameters (e.g. "... where id=:id"). Adjustable .paramstyle: adjust the parameter style on connections and cursor as needed. cursor.scroll() to scroll the cursor in result sets without actually fetching data. cursor.prepare() to prepare SQL statements for execution, without actually running them. This allows creating pools of cursors for dedicated purposes, checking for syntax errors or moving data access plan calculations outside inner loops. connection.dbapi to have the right module level mxODBC Connect objects readily available without having to import them separately. cursor and connection objects usable as Python context managers. cursor.executemany() accepts iterators/generators as parameter "sequence". cursor.cursortype to easily adjust the used ODBC cursor type to your application's needs. ODBC cursor/connection option methods to adjust ODBC cursors/connections to your application's needs and optimize performance by e.g. declaring a connection read-only. Supports Python type binding and database SQL type binding for efficient data exchange. Multi-Version Python Support: mxODBC Connect Client works with Python 2.5, 2.6 and 2.7. Full 64-bit Support: mxODBC Connect Client supports all 64-bit Python platforms. Support for all recent ODBC Version : mxODBC Connect Server works with ODBC drivers implementing the ODBC version specifications 2.0 - 3.8. Stable, robust and reliable: The mxODBC API has been in active use for more than 15 years. Easy Configuration: A single INI file to configure the mxODBC Connect Server on all supported platforms. Enterprise Level Security: Commercial grade TLS/SSL encrypted communication, certificate based client authentication and server access control, username/password authentication. All in addition to the standard database access control and user management features you already deploy in your database servers. The mxODBC Connect Clients requires installation of our Open-Source eGenix.com mx Base Distribution. If you also want to use SSL encrypted network communication, you can either use the standard Python ssl module or install the eGenix.com pyOpenSSL Distribution to benefit from more advanced features. Both eGenix distributions come as easy to install prebuilt binaries and are available on a wide variety of platforms. The mxODBC Connect Client is a royalty-free download and can be installed on any number of machines, subject to the eGenix.com Commercial License Agreement, Version 1.3.0 together with the eGenix.com mxODBC Connect Client 2.1.0 General Proof of Authorization. an unlimited number of concurrent connections. If you are intending to upgrade from an existing mxODBC Connect Server license to the new mxODBC Connect Server 2.1, please contact the eGenix.com Sales Team with your existing license serials for details for an upgrade discount coupon. We will give out 20% discount coupons for upgrade purchases going from mxODBC Connect Server 1.x to 2.1 and 50% coupons for upgrades from mxODBC 2.x to 2.1. After upgrade, use of the original license from which you upgraded is no longer permitted. Optionally install the eGenix pyOpenSSL Distribution if you want to benefit from enhanced SSL support. Basic SSL support is available using Python's standard ssl module. Configure and test the setup. Please see the mxODBC Connect documentation on how this is done. You will need to have one of popular ODBC managers for Unix installed on the target system: iODBC 3.52.x or unixODBC 2.3.x. We have successfully tested the product with iODBC 3.52.7 and unixODBC 2.3.2. By downloading, installing or using the eGenix mxODBC Connect Client, you agree to the terms and conditions set forth in the eGenix.com Commercial License Agreement 1.3.0 together with the eGenix.com mxODBC Connect Client 2.1.0 General Proof of Authorization. Note that should still install the eGenix.com mx Base Distribution before proceeding with the following steps as explained in the download section. The egenix-mxodbc package includes a requirement for the egenix-mx-base package, so most installers will attempt to install egenix-mx-base automatically.